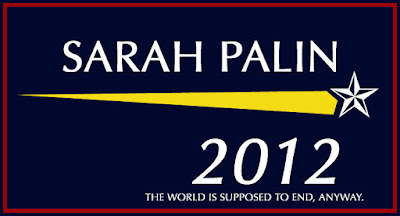 If Obama gets his way legislatively, 2012 for Palin may indeed be too late to save the world. It's a good thing Palin is such a phoney who only cares about her personal enrichment, because it almost guarantees she won't run in 2012. She wants the attention, but not the responsibility that comes with high office. I'm not sure she could save a seat in a restaurant, let alone the world. I find it funny that the left talks about how stupid and irrelevant Palin is, and yet they keep obsessing over everything she does and says. It seems a lot more like fear to me. It's the media - dominated by right wing talking heads these days - that makes every single Facebook blathering from Palin into news. Anyone who follows politics, therefore is bombarded with Palin nearly everyday. There's no fear - it's shock. How can someone so completely unqualified, unprepared, ignorant, bigoted, and dishonest even be considered for the highest office in the land. You guys bend over backwards to make Palin out to be more than she is - an inconsequential, failed half-term governor of a state with few people. I mean, even Jay Leno added a laugh track to her appearance on the Tonight Show to make her seem more likable. She is a train wreck, and I hope you guys on the right get on board! Right-wing media? That is about as big a fairy tale as global warming. "How can someone so completely unqualified, unprepared, ignorant, bigoted, and dishonest even be considered for the highest office in the land." I am still trying to figure out the answer to this question as regards our current president. Further I can give you a long list of specific examples of him justly being labeled by the adjectives you provide above, sir. Comparing the intellect of President Obama to that of Ms. Palin shows a lack of seriousness on your part. I get it that you hate the president, but to imply that he is stupid, bigoted, or dishonest is just partisan hackery. And as for qualifications, it is a moot point as he IS the president. The American people made the judgment, and they made the right one. Besides, the right hates intellectuals and smart people. Remember, the elites? So, having some numbskull who needs to write "tax cut" on her hand is perfect for the anti-science, anti-intellect party. And it is a fact that the media has been tilting rightward for years. Why else would Sarah Palin tweeting about her fantasy death panels be news if not for right wing bias? Why is John McCain the most frequent guest for the last 5 years on Meet the Press? Why has Newt Gingrich (who hasn't been in office for more than a decade) been invited on the Sunday political shows 10x more often as the actual speaker? Why do guests on political shows favor conservative talking heads 2 to 1? The myth of the liberal media has been buried by actual facts. I was going to rebut your diatribe point by point, but I figured what the heck would be the point? You are happy in your fantasy world, so that is fine. Do you even acknowledge that Obama's approval ratings are tanking and that the American public is having serious buyer's remorse because he evidently is not as bright or qualified to be president as the people thought he was? Obama has been fully unsuccessful in achieving anything of substance on his commie wish list, despite having overwhelming majorities in congress. Yeah, he is a heck of a leader alright. Ummmm....no. Because the president's personal approval rating is above 50 on every major poll. The "buyer's remorse" comment comes straight from the RNC and Fox News. Real people don't think that way - only rabid, wingnut teabaggers. Seriously, try watching another channel besides Fox for just an hour. You'll see that you are being misled in a huge way about how people actually view President Obama. It is a fringe position to call him a commie, say he is stupid or unqualified, or not accomplishing anything. It's not borne out by actual facts. Polls are capable of producing all kinds of results depending on how you ask the question, but the opinions you have on Obama are only shared by about 10-15% of the population according to any polling data out there. You suffer from Obama Derangement Syndrome. Not sure there's a cure for it.